When there is a significant spider infestation inside your home, the DIY spider killer sprays sold in stores are generally ineffective. They only work if the spray lands directly on the spider; the spray residual does not have a long-lasting effect. While it may feel good to kill a few of them by dousing them with a spray, these over-the-counter remedies are not an effective long-term control strategy. It is just as effective, less expensive, and far less toxic to just crush the offending spider with a rolled up newspaper or shoe. Cowleys Pest Services offers safe and effective spider control and removal solutions for your home. Continue reading to learn more about spider control methods or contact us now to schedule an inspection and free cost estimate! Get a Spider Control Estimate! Cowleys Pest Services offers pest control service plans that make it easy to “spider-proof” your home from future infestations. Your pest control professional will conduct an inspection of your home to determine possible entry points and take the appropriate steps to reduce the risk of a later re-infestation. There's no sense in removing the spider infestation if the cause of the infestation remains. Eventually, without habitat modification and blocking access points, the spiders will return. One method we use to solve a spider infestation is sorptive dusts applied in cracks and crevices, attics, wall voids and other enclosed or unused spaces. This dust-like film dries out the spiders once they touch their outer covering. The starting point in the management of spider populations is that spiders are primarily beneficial creatures that consume many plant-destroying insects. We want to encourage their activities in the garden. The focus of spider management is INSIDE the home. The best approach for controlling spiders in and around the home is removing hiding spots for secretive spiders and regularly cleaning webs off the house with brushes and vacuums. Spiders enter a structure either through cracks or other openings or by being carried in on items like plants, firewood, and boxes. Regular vacuuming helps remove spiders and their webs. Seal cracks in the foundation and other parts of the structure as well as gaps around windows and doors. Preventing access in the first place is the best defense with both spiders and bugs. If insects are let in the house, spiders will often follow since that is their food. In storage areas, place boxes off the floor and away from ways to prevent them from being used as harborages. Boxes are also attractants for termites so box storage, in general, is not a good idea. If boxes are being used for storage, they should be well sealed to prevent them from taking up residence within. Outside, keep the area next to the foundation of the house free of leaf litter, heavy vegetation, and other accumulations of materials. This will discourage spiders from taking up residence near the structure where it is only a matter of time before a few decide to move indoors. Sweep, mops, hose, or vacuum webs and spiders off buildings regularly. Outdoor lighting attracts insects, which in turn attracts spiders. It is always better to keep lighting fixtures off structures and away from windows and doorways even if aesthetically pleasing. Most spiders have toxic venom to kill their prey, but “poisonous” spiders are limited to those whose venom typically causes a serious reaction in humans. In New Jersey, the most common poisonous spider is the black widow. The other well-known poisonous spider, the Brown Recluse Spider (Violin spider), is typically found in the central Midwestern states southward to the Gulf of Mexico. Recluse spiders have a violin-shaped mark on the topside of their head region, but the mark is not always distinct. In New Jersey, the poisonous spider of concern is the black widow. The black widow gets its name from eating the male after mating. Venom from its bite can cause a serious reaction, but death is very unlikely and many symptoms can be alleviated if medical treatment is obtained. The male black widow’s fangs are too small to break human skin; only the female black widow can bite through a person’s skin and inject enough venom to cause a painful reaction. The female black widow has a shiny black body, slender black legs, and a red or orange mark in the shape of an hourglass on the underside of its abdomen. The American House spider is a cobweb spider, like its relative the black widow. Cobweb spiders leave the classic Halloween webs -- tangled messes in the corners of the attic or windows and the females are much larger than the males. Unlike the Black widow, the venom of the American House spider is not poisonous and they are generally harmless around people. They usually opt to ‘play dead’ if threatened although if handled roughly, may bite. New Jersey’s yellow sac spider is an aggressive spider that regularly bites humans. They are small, just ¼ inch, a pale yellow color. These spiders get their name from the telltale white, papery sacks of silk they produce daily, often found along ceilings, in corners, and behind pictures or shelves. 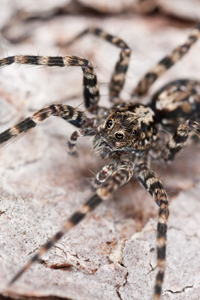 These quick-to-bite spiders instantly produce an intense stinging pain similar to the sting of a wasp or hornet. Another common spider in New Jersey is the wolf spider. These are big, hairy dark brown or black one and a half inch spiders that are intimidating looking to say the least. They bear a resemblance to tarantulas, which fortunately are not found anywhere near New Jersey. Wolf spiders are ground dwellers that do not spin webs. They feed on other insects and seek refuge in dark basements, crawl spaces, and garages near their wooded habitat. Spiders are generally beneficial by helping to minimize the population of harmful insects. But for many, the ecological benefits of spiders don’t matter once they start invading our living space. While many have a fear of spiders, for some, the fear is so great that is rises to the level of a phobia, a severe anxiety disorder, called arachnophobia, one of the most common phobias. Spiders resemble insects and are sometimes confused with them since they are both creepy-crawly things we don’t want in our homes, but spiders are technically arachnids with eight legs and two body parts, a head, and an abdomen. They lack the wings and antennae of insects. Although spiders are often found on plants, they eat mainly insects, other spiders, and related arthropods, not plants. Need help with a spider problem? Contact us today! 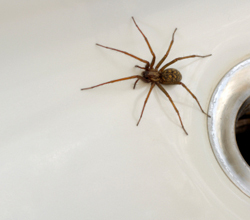 Whether you have a fear of spiders or not, nobody wants to deal with a spider problem in their home. Getting rid of spiders for good can be a challenge, but the professionals at Cowleys Pest Services make it easy. We offer pest control service plans and a 100% satisfaction guarantee! Contact us today to schedule an inspection with us and we'll provide you with a free cost estimate for the spider control services you need. We offer complete pest control services throughout Mercer, Ocean, Monmouth, Middlesex County, NJ, including Edison, Woodbridge, Lakewood and surrounding areas.